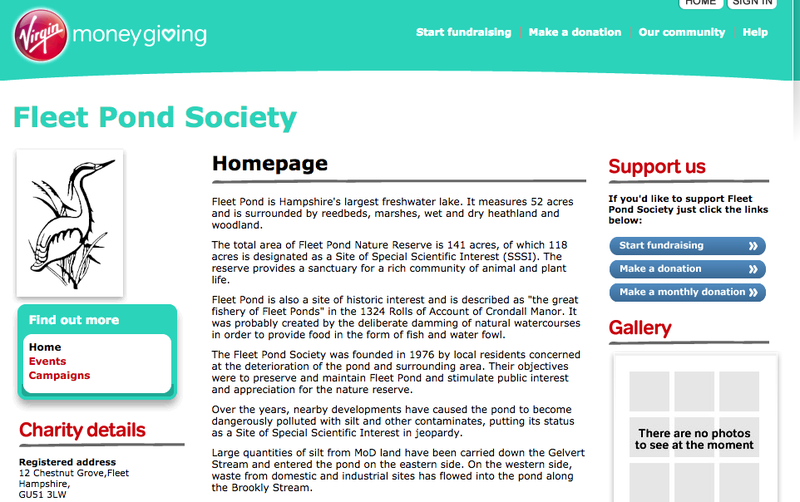 If you regularly read this blog you will be familiar with the myriad ways Fleet Pond Society helps maintain and develop the Pond for the benefit of the local community. Although we carry out activities to raise funds for our tasks and projects, additional funds are always welcome. One way of supporting the Society is to join it and in so doing receive an attractive newsletter that gives details of all the main activities that take place (see here). However some readers may prefer to simply make a donation. This can be done online, quickly and easily, by using our Virgin Money Giving page which can be found here (see Make a Donation on the rhs, as indicated in the screenshot above). All donations, no matter their value, would be greatly appreciated.